Emerald Adrift is a nom de plume of composer and electronic musician David Herpich. Eclectic yet unified, the music of Emerald Adrift explores the unusual confluences of melodic synth-pop with avant-garde abstraction, meditative ambiances with propulsive rhythms, and purely electronic timbres with otherworldly manipulations of sounds from everyday life. An interest in diverse synthesis technologies has led to the use of various commercial and academic computer-based applications, numerous additive, wavetable, FM, and analogue keyboards, and vintage rarities such as the E-mu and ARP 2500 modular systems. Throughout it all, Emerald Adrift has maintained a consistent approach to sonic expression which defies any obvious genre categorization. Founding member David Herpich holds degrees in music theory and composition from the University of Kansas, and completed his master's degree in contemporary composition as a recipient of the University Graduate Fellowship Award at the University of South Florida in Tampa. 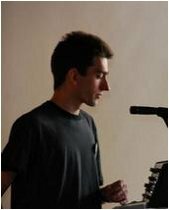 At both institutions, he focused his studies on electronic music, working under Michael Timpson, Paul Reller, and Edward Mattila. In addition, Herpich has written award-winning works for acoustic ensembles, scored theatre, dance, and film productions, and lectured on the music of Karlheinz Stockhausen. He is currently the host of Zen Caffeine, a weekly program on the StillStream internet radio station.